Hi, I’m Amanda and can usually be found over at City Girl Gone Coastal, I found my crafty wings kind of late in life, after the birth of my twins, and the drop in salary, coincidence me thinks! I don’t have a particular niche in crafts, as these projects show; I’ll give anything a go and wing it if necessary! 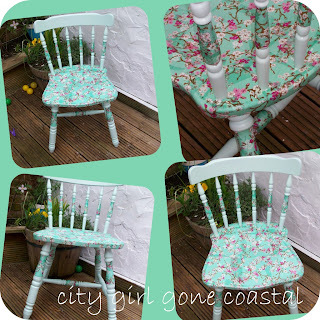 This here is one of my favourite projects, a napkin decoupage & spray painted chair, awesome results for very little effort! This was my first real introduction to spray paint, can’t believe I waited so long! 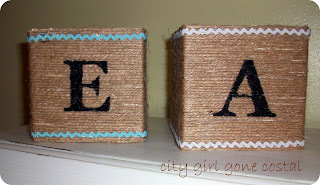 These storage pots were inspired by some storage solutions I saw in the Ballards catalogue, it was one of those simple projects that gave great results, who knew twine wrapped around some boxes could look so good. This has to be the oddest idea I’ve had in a while, whilst dismantling an Ikea sofa to take to the dump, I decided to make it into a ladder for my bathroom, random, and saved about £70, result! So that’s a few of my favourite projects, from knock offs to refashions to the plain ol’ crazy ideas of a SAHM, you can find them all and more besides at my blog, drop by and say hi!